Deer Tick records are like drunken nights when you get ripped with your friends and blab the truth. Or maybe you lose your friends, and cry your heart out alone about a bad breakup or a parental scuffle. Whatever happened, it’s front and center. And it feels good, like a therapy session. 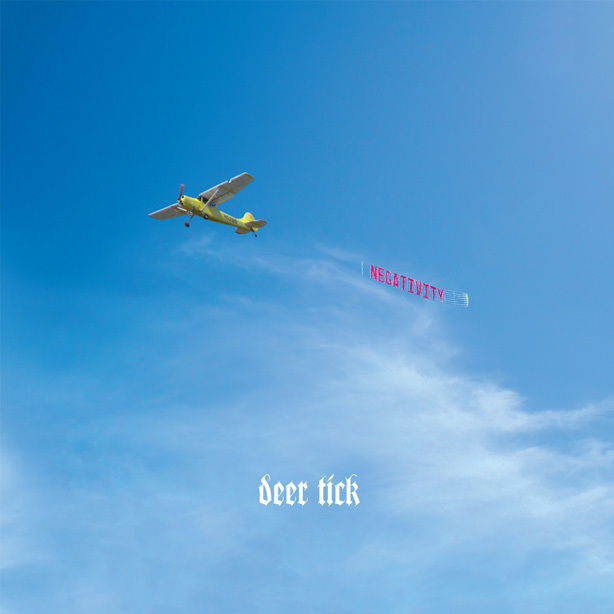 Since 2004, Deer Tick has been genre bending and morphing folk rock with John McCauley as their fearless leader. (It actually all started when McCauley convinced his parents to let him tour the U.S. and play music instead of going to college.) Even though the band has been criticized for heavy drinking and live shenanigans, the truth is, their catalog is stripped and earnest. Their newest release, Negativity, will stir up butterflies in your stomach and have you crying between the sheets. It’s a portrait of hard times, of romance and heartbreak – every emotion is on display. McCauley’s anger and abrasive lust for life shines through. “Mr. Sticks,” his father’s nickname, is about familial struggles – his dad was recently sent to prison for tax evasion. “Hey Doll” is a bruiser of a breakup about McCauley’s recent broken engagement due to his boozing and drug use. Steve Berlin is producing this time around. He’s worked with The Blasters and Los Lobos and is helping Deer Tick with their craftsmanship. This record is finely tuned and seasoned with life’s rough edges. Negativity is relatable. Some of it sounds like what you do all day, like waiting for the coffee or yearning for a lover. Other parts apologize for the human condition. McCauley makes you wonder what friendship is really about. Through five records and just as many EPs, they’re still moving in the right direction, just getting better with age. Negativity is their best work yet. No longer just a soundtrack to a bar brawl, this record is versatile. They’re staring rock and roll in the face with finger picking close at hand. McCauley tells us he wants to fall in love with the open road again and has the guitar solos to match. Negativity has a few horn choruses, muted trumpet and more heavy lifting done by piano – like on “Just Friends.” McCauley shares a few vocal duties over the dozen tracks, a few with Vanessa Carlton. It sounds as if he’s finally feeling comfortable in the direction he’s heading. Sure, he has his days of misery (and don’t we all) but now he knows how to dig himself out of the ditch. McCauley’s always been a shape-shifter of sorts. Not only is he a crooner and a screamer, he also fronts the band’s alter ego, Deervana, which is exactly what it sounds like. Recently, they played In Utero in full, in honor of the record’s 20th anniversary. Grunge vibes of self-loathing, emotional distress and mood swings by guitar have been lending a hand to McCauley’s songwriting for close to a decade. Kurt Cobain is just one of the many men McCauley looks up to (and it’s just not when he wears a dress on stage.) The father of grunge, Neil Young, is also a frequent presence in Deer Tick’s sound – they can blast you with noise while remaining in tact. Still experimenting with their output, Deer Tick sounds bent but never broken. You have to take their Negativity with a grain of salt. It’s a shame you don’t have a donate button! I’d certainly donate to this fantastic blog! I suppose for now i’ll settle for bookmarking and adding your RSS feed to my Google account. I look forward to brand new updates and will talk about this website with my Facebook group. Talk soon!